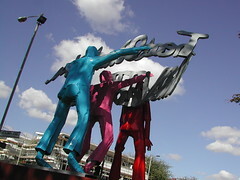 To promote their tv series The New Ten Commandments, shown in February 2005, Channel Four commissioned this sulpture by Sokari Douglas Camp. It’s called “The 11th Commandment”. It represents the most popular new commandment as chosen by the British public: “Treat others as you would like to be treated” (see also British Humanist Assocation on the Golden Rule). Looking for ideas for the sculpture, Douglas Camp wrapped herself and her children in the comfort and security of shawls. In the sculpture these have been transformed in to “Graffiti shawls” using the words of the commandment to protect and comfort the figures. It’s currently on Peckham Rye Common (on the corner of East Dulwich Road and Peckham Rye) and will be going on tour to other London boroughs (Bexley, Islington, Hackney and Enfield) soon.